Most people can remember fondly childhood friends and games, but not many can imagine a partnership that has its roots on an Evansville baseball field for two Little Leaguers in the early 1960s. 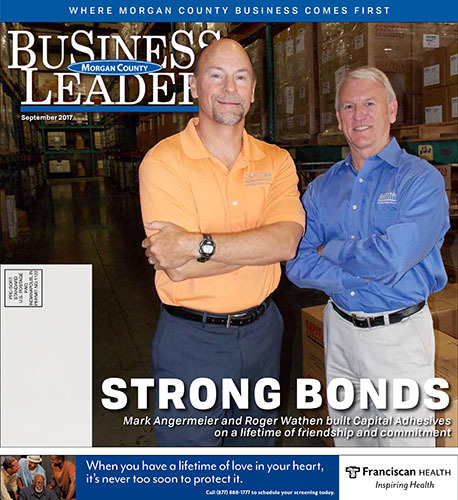 At that time Roger Wathen and Mark Angermeier were probably more concerned about getting a hit or making a play than building an international business nestled in the hills of Morgan County, Indiana. The two boys grew into young men together, attending church, taking classes, and pushing themselves in sports at Mater Dei High School in Evansville. The pair stayed in contact after graduation. Wathen went to Indiana State (now University of Southern Indiana) to study chemistry and Angermeier left for West Lafayette to study accounting at Purdue. Accounting didn’t present the challenge Angermeier sought which led him to change his major to chemistry. Throughout college, the pair would reconnect with friends to go boating and skiing and the friendship between the two continued to develop. Eventually conversations led to dreams of owning a business together. It was 1982 and college graduates were facing an economy mired in recession; jobs were scarce and lucky candidates took whatever was available. Wathen took a lab job at Eli Lilly in analytical research and development. He was a member of the team working on groundbreaking insulin technology, primarily involved in developing methodology for manufacture of the product. Angermeier took a position in chemical sales, specifically adhesives, for National Starch and Chemical. With similar work ethics and philosophies, both men had similar ambitions: to do their best in whatever they were involved in and to be successful. Wathen had married his high school sweetheart, Natalie, and had their first child, Marie. Angermeier married his college sweetheart, Elaine, and they had started their family with son, Zach. Both were financially comfortable and life was good. Wathen soon realized that to move out of the lab and advance, he was going to have to move his family out of Indianapolis. “Staying at Lilly would have been a good place to work,” Wathen said, “but there were limitations on what I was willing to do.” He knew that turning down opportunities could limit your future in a large organization.